Hephzibah, GA – James W. Brigham, Jr, husband of Sandy Brigham, entered into rest on his 71st birthday, Tuesday, February 5, 2019, at his residence. Funeral services will be held Friday, February 8, 2019, at 3:00 PM from Hephzibah Baptist Church, 2527 Highway 88, Hephzibah, with Dr. C. Michael Wren, Jr. officiating. Interment will follow in Hephzibah-Vance Cemetery, 4789 Windsor Spring Road, Hephzibah. Mr. Brigham, son of the late Marjorie Bacon Brigham and James Wilson Brigham, Sr, was born in Savannah. 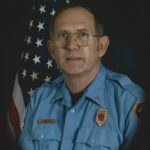 He served in the US Army Reserves and retired after 34 years as a Fireman and EMT with the Augusta Richmond County Fire Department. He also worked at Southeastern Equipment Company and volunteered with the Hephzibah Fire Department. He was a member of Hephzibah Baptist Church and the Bible Book Sunday School class. In addition to his wife he is survived by his children, Robert Brigham, of Hephzibah, and Jamie Brigham, also of Hephzibah; his grandchildren, Jacob Brigham, Conner Brigham, Ryan Brigham, Valerie Brigham, and Tillman Brigham; and his sister, Jane Wiggins, of Augusta. Pallbearers will be members of the Augusta Richmond County Fire Department. Honorary pallbearers will be members of the Bible Book Sunday School class. If so desired memorial contributions may be made to American Parkinson Disease Association, Georgia Chapter, PO Box 49416, Atlanta, GA 30359. The family will receive friends, Thursday, February 7, 2019, from 6:00 until 8:00 PM at the funeral home.